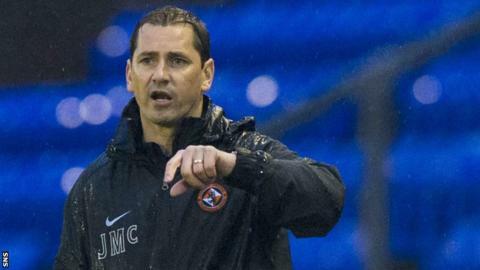 Jackie McNamara says Johnson is a "crowd pleaser"
Jackie McNamara says Dundee United beat off competition from other clubs to sign winger Justin Johnson. The 19-year-old has spent two months at Tannadice on an amateur contract after leaving FC United of Manchester. But the Englishman has secured a three-year contract after spending time with the Terrors' development squad. "I would have had him involved with the first-team squad already, but we knew there were other clubs after him," said manager McNamara. "And we wanted to make sure we had him signed up. "We see great potential in Justin. He is fast, direct and entertaining. "There is a lot of hard work ahead, but we now have a chance to develop him into a first-team player at Dundee United." Johnson's previous experience is in England's National League North. However, United hope they have similar success as they had in developing Andy Robertson, now with Hull City, Aidan Connolly and Blair Spittal after they were signed from Scotland's lower leagues. "He is the type of player we want to develop and play at Tannadice," said McNamara. "He's a crowd pleaser. It will now be our job to turn that potential into a player the fans will be entertained by." Johnson added: "This club has a reputation for developing young players and I want to grow as a footballer and believe this is the place for me. "It has been very enjoyable training and playing at Dundee United. "Although other clubs showed interest in me, the way I have been treated and involved in my time here was an important factor in signing a contract here."